This is a sponsored post for Best Buy. I have been compensated in the form of a Best Buy Gift Card and/or received the product/service at a reduced price or for free. All opinions are always my own. Now is a great time to stop in and take advantage of Best Buy's Grad Gift Sale. Do you have a daughter or son who has graduated and about to embark on the big bad world all alone in their own place? Even if they're already there, it's never too late to give them a welcoming gift. There are so many things you can give them to brave the world a little bit easier. Kitchen appliances are always very useful. No Kitchen is complete without a nice blender to make those healthy smoothies they can take on the go. If they were never big on health and you're not there to force veggies down their throat, make it fun for them to do it themselves by mixing yummy vegetable and fruit green smoothies in a new blender. My favorite Best Buy product for a new grad is The Nutri Ninja Pro Blender. It's cheaper than most, but is a real work horse. The feature I love about it is the grab and go glass. You can make the smoothie in the same glass you drink from. So easy and convenient! I only wish I had something like this in college. They also carry regular big blenders and food and drink mixers, which would come in pretty handy at parties. It's such an amazing way to stay healthy and it won't break your financial health either! I own a Ninja and I can vouch for it's effectiveness. I have a green smoothie almost every morning and it takes only a few minutes to whip up a delectable smoothie much cheaper and fresher than your local stores and smoothie joints that will tempt them non-stop. The Ninja Blender even made it into the top 10 best blender awards of 2014! Don't miss out on the 3 Day Grad Sale ending June 21st! Other great ideas for your little (or big) brave one venturing into the unknown. Are they a networker, fitness fanatic or do they encompass many different types? Whichever they focus on most, Best buy has everything for every facet. For those on a budget, check out the $50 and under gifts for grads! Do you love twitter parties? Best Buy is hosting two Grads Twitter Parties on Thursday June 19th (6/19) at 7PM CST and Tuesday June 24 (6/24) at 7PM CST. Feel free to join one or both of these parties for a chance to receive Best Buy gift cards and other great prizes. 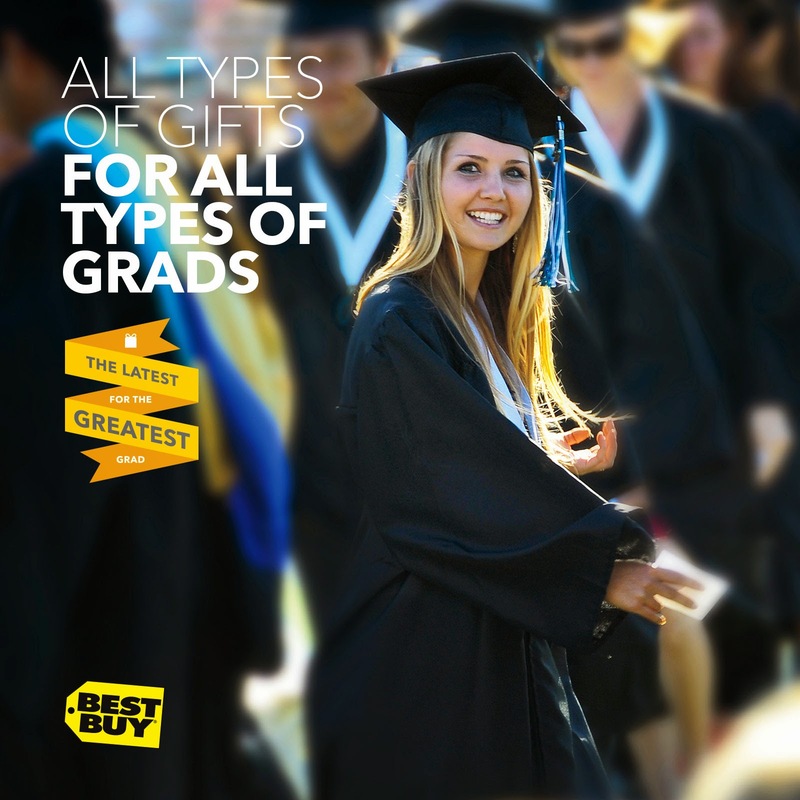 Tweet #GreatestGrad with your favorite Grad's Gift ideas from Best Buy.